Gentleman: A Timeless Guide to Fashion, Bernhard Roetzel – click for facebook – and other superb books by the same author. As Mr Roetzel notes in his blog, the book should be titled “A Guide to Timeless Fashion.” Buy it anyway. Bonus link: Alan Flusser – click to enjoy your free read! Finally, courtesy of The Rake.com, 10 commandments of G Bruce Boyer, author of “Elegance” and other masterful books on style. 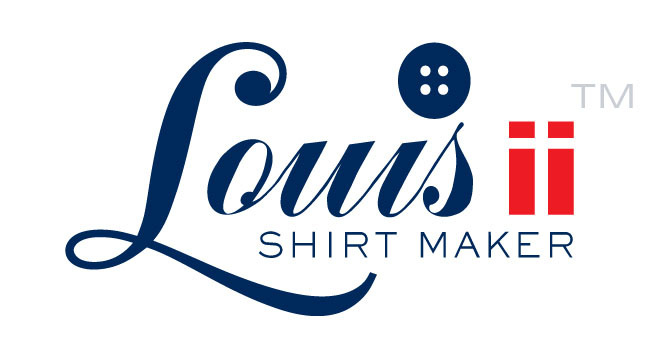 Now for Louis ii Shirts’ advice – use as you wish, no laws of fashion and style! Wear good shoes, not only for the impression they create, but also for their longevity. Cheap shoes always look cheap and they’re expensive in the long run: you buy more pairs of them. Good quality shoes always look good and last for years. Depending on construction, for example welted soles, they can be re-soled many times. 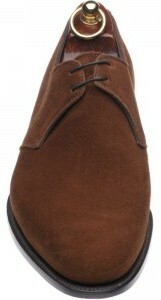 An Oxford is a lace up shoe with the bottom of the lacing part sewn closed. The Derby shoe has the lacing section open at the bottom, and can therefore be a more comfortable shoe to wear if you have wide feet – the “flaps” with the laces can be opened wider than on an Oxford, which opens in a more restricting V shape. Both the Oxford and Derby can have toe caps, and in brogue or semi brogue, or in whole cut. An Oxford is also known as a Balmoral, esp. in USA, and in France it can be a Richelieu. 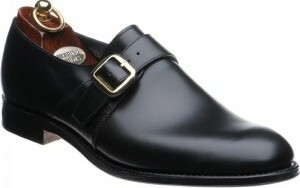 The Derby style shoe is sometimes known as a Gibson; in Germany its a Blücher. Brown suede shoes with a navy suit can look pretty cool. Black for work, brown for weekend? Different countries have different ideas and anyway, “rules” are made to be broken. You get what you pay for. If you can’t afford anything else, a good shirt and good pair of shoes is all you’ll need; the rest can wait. Inexpensive shirts have inexpensive fabric, inexpensive construction, or both. Something has to give if the price is low. The converse is not necessarily true but expensive shirts will generally have high quality fabrics with high quality construction. They’ll last well, look good for many years. You could expect 5 to 6 years from a top quality shirt worn in rotation. Some shirts are expensive because of a brand name rather than, shall we say, provenance. Buy wisely. 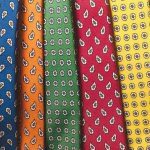 If you regularly wear ties, buy silk – expensive but the lustre (and longevity) is far superior to the cheap shine of a polyester tie. If you seldom wear a tie but need one from time to time, buy a dark coloured silk tie to suit all occasions from formal to funeral. If you wear a bow tie, get a real one that you tie yourself, difficult at first, easy thereafter and it does look real, unlike the short-cut ready made bow tie. In black silk of course with a DJ – and black tie on the invitation really does mean BLACK TIE. 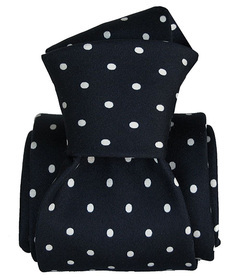 Or with spots if you must, a bit poncy but also works with a business suit. Or even some sort of design if you want to make some sort of statement! A suit should be all wool or with a mix of cashmere or silk. Cooler than man-made, the drape is superior. Wool holds and returns to its shape quickly. Not necessarily in very high “super” numbers which can be so delicate they don’t stand up to frequent wear and cost inordinately more: 100’s and up to 120’s is perfectly fine, 130’s is still serviceable. Beyond that might be a waste of money. But not if you want it and can afford it. In which case, 2 pairs of trousers with a suit. Or have it made for you. Even with floating canvas it will probably be less expensive than an off-the-rack suit of equivalent quality cloth. It will fit you properly (provided you find a good cutter and tailor, dying breeds) and could last a lifetime. Then it can be passed down. Linen is also OK but it creases easily – although that was made into a selling point: if its creased, it must be expensive! They may look similar but a handkerchief is for blow, a pocket square is for show. The pocket square is usually of silk and a handkerchief of cotton or fine linen. The pocket square shouldn’t match your tie. Then it looks like you bought one of those department store matching tie ‘n hanky gift sets. It should be complementary to the tie in terms of colour; not of the same colour and pattern. Too many styles to mention and who’d take advice from a hot country? Anyway, if you want a Barbour – at last available in Johannesburg and Cape Town – or a Drizabone (terrible name, great product from Aus) or a Loden if you want to look Hanseatic – yes, we know Austria and Germany are different countries … buy it if you think its stylish. Who cares, buy because it keeps you warm ‘n dry. On a 2 button coat, fasten the top button; on a 3 button coat, fasten the middle button; if you wish, also fasten the top button. On a cardigan, leave the bottom button undone, also on a waistcoat. Its an old “rule” possibly from the time of Edward VII – corpulence may have made it uncomfortable to fasten his bottom button and this was copied, slavishly you might say, by his court, by the aristocracy, and by the middle classes. In many countries people still notice. Double breasted – again, bottom button unfastened, but optional, no problem to button all. Single button coat, eg, DJ (tux), fasten it, unfasten when you sit down. Applies to all coats. fasten again when you stand up. On a 4 button coat, dunno really. Suppose the bottom button should be undone to show you at least know something. Real working cuff buttons? Leave ’em fastened. You know they can unfasten. If others don’t, so what. They weren’t invited to dinner. Generally – its not a hard and fast rule – don’t mix stripes. 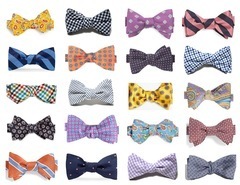 If you wear a striped shirt, wear a plain tie or a tie with spots or repeated motif as contrast to the striped shirt. But it all depends on the boldness of the stripes. Not to mention the regiment or the school! A finely striped shirt can look good with a bold striped tie or suit. And if the stripes of a shirt and a suit are both REALLY bold it can sometimes work too. But then the tie definitely should be neutral. Judge for yourself if they complement one another or clash with each other. Stand out from the crowd. Don’t dress as though you’re a walking icon for dull wintry weather. Wear something colourful, for example, a navy suit looks great with a bright yellow silk tie; or a grey suit & light blue or white shirt with a red tie. Consider bright socks. Fine on fashion items, but don’t wear articles of formal or business clothing with the label on the outside – the realm of the recently arrived, surely not you.